Graves eye Disease is the most common cause of an overactive thyroid gland. Are you experiencing symptoms of anxiety, irritability, fatigue and weight loss (despite of normal food intake)? Are your eyes bulging out more than they used to? You may have Graves Eye Disease. Graves Eye Disease is the most common cause of an overactive thyroid gland. This condition is autoimmune, meaning that it occurs when your immune system mistakenly attacks your thyroid gland and causes it to overproduce the hormone thyroxine. 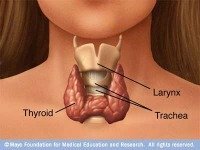 The thyroid is a gland shaped like a butterfly located in front of the neck below the larynx, or voice box. This gland makes two thyroid hormones (triiodothyronine [T3] and thyroxine [T4]). Thyroid hormones affect metabolism (the rate at which the body converts food into energy), brain development, breathing, heart and nervous system functions, body temperature, muscle strength, skin dryness, menstrual cycles, weight, and cholesterol levels. The production of these hormones is regulated by another hormone called thyroid-stimulating hormone (TSH), which is made by the pituitary gland located in the brain. In Grave’s Disease your immune system makes antibodies called thyroid-stimulating immunoglobin (TSI) which attach to thyroid cells. What is Graves Eye Disease (or Grave’s Ophthalmopathy)? Most patients presenting with hyperthyroidism (or overactive thyroid) associated with Graves Eye Disease will have some evidence of Thyroid Eye Disease. Thyroid Eye Disease (TED), also known as Grave’s Ophthalmopathy (GO) is the most frequent manifestation of autoimmune hyperthyroidism outside of the thyroid gland. Eye involvement can be observed in 25-50% of patients with Grave’s Disease, of whom 3-5% develop severe disease. Because the eye disease may present before the hyperthyroidism or even occur for the first time years after successful treatment of hyperthyroidism, GO has been described as a separate, organ-specific autoimmune condition which frequently coexists with Graves Eye Disease. GO has its own natural history with a period of deterioration, followed by one of stability, and finally some improvement. Although separate conditions, GO will worsen if thyroid function is not controlled. What are the signs and symptoms of GO? If you experience sudden eye symptoms such as Diplopia, bulging eyeballs, or decrease in vision, consult your eye doctor immediately. The first step in diagnosing GO is getting a comprehensive eye examination. If the eye exam leaves your eye doctor suspicious of GO, he or she will recommend laboratory testing to rule out thyroid problems. Thyroid function testing will include measures of TSH, thyroxine (total and free T4), and triiodothyronine (T3), and thyroid stimulating immunoglobin (TSI). Also, orbital CT scan can help detect extraocular muscle enlargement. Any underlying thyroid disease should be managed by an endocrinologist. In terms of the eyes, surgery will be postponed until the eyes are stable for a period of nine to twelve months except in cases of Optic Neuropathy or extreme bulging of the eyes which could make symptoms of Dry Eyes severe. Orbital bone decompression: This procedure is used for compressive Optic Neuropathy and should be performed by an oculoplastic surgeon. Initial treatment involves use of oral steroids (prednisone 100 mg every day for up to 14 days). Strabismus Surgery: The initial treatment of inflammation of the extraocular muscles of the eyes with the use of oral steroids (prednisone 80-100 mg every day for 1-2 weeks, then tapered over a month) is controversial. Fresnel prisms are used on eyeglasses to help with the Diplopia. Surgery is considered after a six-month stable interval and after orbital surgery is completed. Eyelid Reconstruction: For Dry Eyes caused by exposure, treatment involves lubricating drops up to every hour while awake and ointment every night. Lid taping or moisture glasses at night may help. Punctal occlusion is reserved for more severe dry eye symptoms. Finally, surgical eyelid recession (or lengthening) is considered after an adequate stable interval.